Zephyrhills 100th Anniversary: Colorful Reminiscences From ZHS History - Zephyrhills, Florida 100th Anniversary! A few weeks ago we had the pleasure of interviewing legendary ZHS Coach John Clements and his lovely wife, Beanie. Our goal was to do a story about the municipal swimming pool that the couple managed for so many summers. They literally taught hundreds of Florida children to swim. Well, we also asked Mr. and Mrs. Clements about their years of service in other capacities and wanted to share with you this week some great stories that truly capture ZHS and Zephyrhills in the developing mid- decades of the twentieth century. Today the Pasco County School system has 430 buses in its fleet that make multiple runs transporting children safely to and from school. 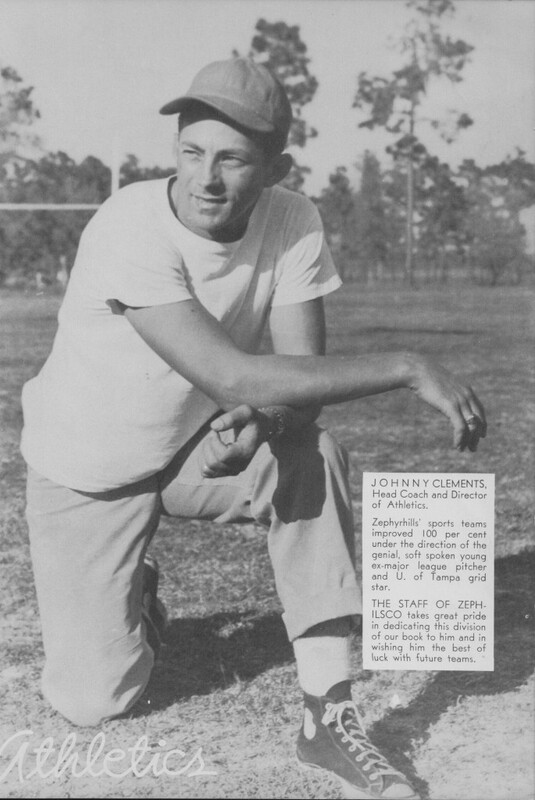 Coach Clements shared that when he first came to Zephyrhills as a coach in 1948, he was often asked to substitute as a school bus driver. 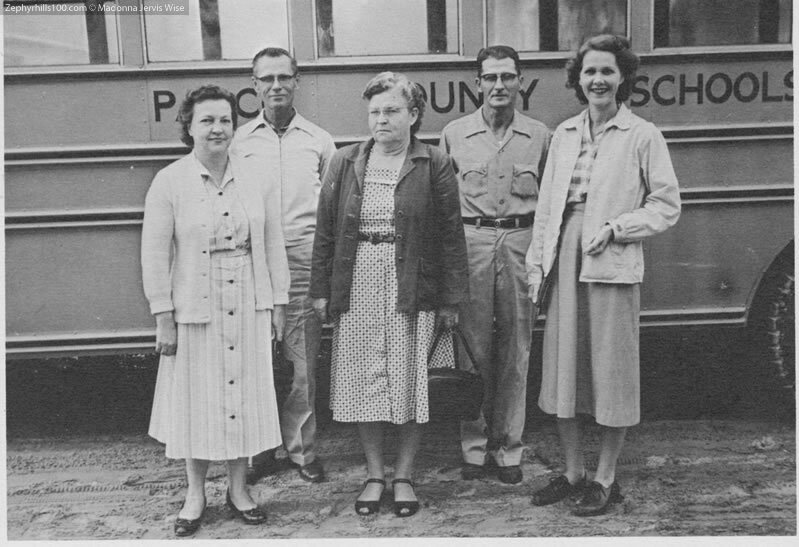 Coach said “I had a chauffer’s license and there were then only three bus drivers in total: Mr. Byrd, Mrs. Smith and Mrs. Tyre. When one of them were sick or absent, the principal, Leon Luckenbach, would call me at 5:00 a.m., and say ‘John, I need you to pick up the kids.’ He would give me the directions on where to go and I would drive the route. Mr. Byrd used to drive the school bus for the sports teams too. He was the only bus driver who drove faster going up hill than down hill! For example, he would go up Greer Hill at say, 50 mph and down the hill at 30 mph. ZHS Principal, Leon R. Luckenbach, may have had a bit of an ego! Leon Luckenbach was ZHS principal from 1947 to 1951. When you chat with old timers around town, he is a principal that is remembered for not only leading the school through some tumultuous times but creating a few controversies of his own. Coach admits Luckenbach was just a bit on the stubborn side. “He was the only ZHS principal to be put in jai! Yes, it was quite a story,” said Coach Clements. “At the time the town had one traffic light and very few policemen on staff. On his way to work, Luckenbach was issued a traffic ticket for running the ‘new’ stoplight. Luckenbach was emphatic that he did nothing wrong and refused to pay the $5 dollar ticket. When several days passed and he remained steadfast that he was not paying, a trial was scheduled in the city hall building,” said Coach Clements. The city hall used to house the city clerk’s office and a jail house with two cells in downtown Zephyrhills; this is the current location of the McClain/Alfonso Law Office. With nearly the entire town in attendance at the trail, the judge ordered Luckenbach to pay the $5 He refused! “What else were they to do but put him in jail,” Coach Clements said. “I remember Toby Smith’s dad and other parents wanted to break in and get OUR principal out of the brig! They were about to have a riot.” Johnny said. “I don’t know who paid the fine but he was released! It was the talk of the day!” Coach Clements said. Johnny shared that Luckenbach and he built two office areas and renovated a chicken shack that was donated to the school and used for the athletic dressing room for years. By Madonna Jervis Wise and Clereen Morrill Brunty of the 100th Anniversary Committee, ZHS. Article originally appeared in the Zephyrhills News on August 6, 2009.